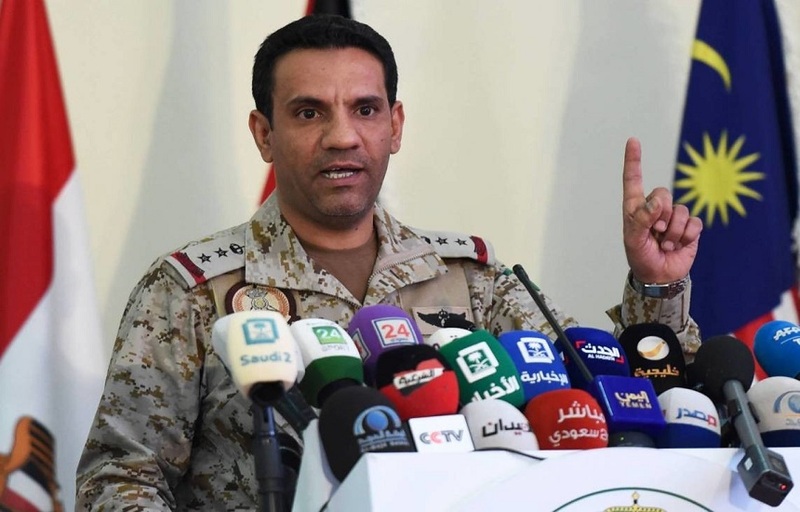 The presence of the joint forces of the coalition on the island of Socotra, is within the coordination with the legitimate Yemeni government, and that coalition welcomes the statement issued by tribes and sheikhs of Saada Province, totally rejecting the Iranian-backed Houthi coup, the Official Spokesman for the coalition forces "coalition to support the legitimacy in Yemen," Colonel Turki Al-Maliki announced here today. Col. Al-Maliki said, at the regular conference of the joint forces of the coalition command that the coalition has begun operating humanitarian air bridge, with two monthly flights as per two-week trip from Sanaa to Cairo. He praised the efforts exerted by the legitimate Yemeni government, the joint forces command, the World Health Organization, in Yemen, to coordinate and overcome all difficulties resulting from the Houthi coup or problems in the airspace, at Sanaa airport, pointing out that the aircraft will transport patients or those in need of health care from Sanaa to Cairo, aboard United Nations' aircrafts. He stressed the Alliance adherence that the political solution, in Yemen, must be done through the three references for the political solution, which are UN resolution no. 2216 Gulf initiative and its mechanism of implementation as well as the outcome of the Yemeni national dialogue. Col. Al-Maliki reviewed the explosion of shrapnel inside the Turkish ship in the waiting area of the port of Salif on Thursday, May 10, at 11.25 pm, pointing out that one of the coalition ships has received a call from inside the Turkish ship, stating that there was an explosion on board the ship, and the ship to the area of operations to secure the safety of ships, as the Houthi militia deliberately accumulate ships in the waiting area, which is only a few kilometers from the entrance to the port of Salif, noting that the ship was carrying wheat coming from Russia and carrying the flag of the State of Turkey, with 23 sailors, which was guided to move to the logistics area. Then the Naval Forces offered to give a hand and it conducted a reconnaissance operation through the naval aircraft and found a hole in the left side with a diameter of about one diameter point five meters, and then the coalition naval forces paid a visit the ship, found an internal explosion on the vessel and for the purpose of verification of the explosion that took place on the ship, it was directed with the consent of the coalition naval forces to the port of Jizan, noting that the ship is now there and that investigation procedures related to the incident will take place. The spokesman reminded the Yemenis the names of wanted terrorists from the Huthi militia who threaten internal security in Yemen and the security of the region and the world, and that the coalition welcomes all communications received in this regard and is treated with strict confidentiality. On the humanitarian side, Col. Al-Maliki said that the air and sea relief outlets are operating at full capacity. He pointed out the results of the comprehensive humanitarian operations in Yemen. Turning to the Kingdom's contribution to humanitarian work, including the cholera control within the previous initiative, it amounted to $ 66.7 million, indicating that the number of beneficiaries was 22,653,842 beneficiaries with $ 10,959,886. Col. Al-Maliki pointed out that the Houthi militia again in the areas controlled by it disrupted the start of vaccines for cholera patients, especially with the approach of the rainy season. He spoke about the initiative launched by King Salman Humanitarian Aid and Relief Centre in partnership with the Comprehensive Humanitarian Support Center in Yemen. He explained that there were 45 medical cadres in the specialties of the brain, nerves, bones, spine, jaw and face. They were transferred to Yemen in a humanitarian initiative to Marib Hospital And Cree Hospital. He pointed out that King Salman Humanitarian Aid and Relief Centre celebrated yesterday the rehabilitation of the third and fourth batch of child soldiers who were deliberately recruited by the Huthi militia of Iran into the fighting fronts. He pointed out that the militia not only recruited the children but sought to force Yemeni women into the battlefield. The spokesman for the forces of the coalition for the support of legitimacy in Yemen reviewed the operational objectives inside Yemen, including targeting a ballistic missile platform belonging to the Huthi militia hidden under the trees and several caves in the province of Saada, which enjoys high protection and represents their missile stores. He also reviewed the targeting of a number of armed vehicles and ration vehicles belonging to the militia in front of the borders of the Kingdom and attacking its elements that carry weapons and used vegetation in hiding. Col. Al-Maliki said that the ballistic missiles launched against the Kingdom to date reached the number of 138 missiles and projectiles 66,302 projectiles, stressing that the losses of the Houthi militia of Iran in positions, weapons and equipment reached 426 during the week. Col. Al-Maliki reviewed some of the seizures of Houthi militia weapons, which were recovered by the Yemeni National Army. He pointed out that Sa'ada and North Amran are still firing areas for ballistic missiles that threaten internal and regional security. It is also the final zone for the arrival of smuggled weapons to the Houthi militia. He said that the Houthi militia of Iran fired six ballistic missiles at Saudi Arabia during the past week, the latest of which was today on Jizan city, deliberately violating international humanitarian law. Article 51 and Article 52. Col. Al-Maliki confirmed that the legitimacy forces achieved rapid successes with the support of the coalition forces, noting that the legitimate forces have become close to Kataf, which represents the main supply routes for the Houthi militias of Iran, and the legitimate forces with the support of coalition forces achieved great successes on the northern axis of Saada. He noted that the coalition forces have been able to clear the city of Midi in the past period and return it to the legitimate government as well as neighboring villages, and the command of the coalition forces began stabilizing operations in this directorate and the establishment of development projects and reconstruction after it was destroyed by the tampering of the Houthi militias, noting that operations are continuing to activate the customs of Haradh and the introduction of humanitarian aid to the people of the province of Hajja and the return of the directorate to legitimacy in the coming days. He said that the forces of the enemy carried out the attack on the positions of the legitimate forces in the eastern and western highlands and the valley and the attack was repulsed by the support of the coalition forces, and the forces loyal to the legitimacy as well as the Yemeni National Army today and with the support of the UAE and Sudanese forces liberated the building of Alhima in the Directorate of Tahaitah of Hodeidah province and enemy forces suffered Loss of life and equipment. He explained that the militias tried to infiltrate the positions of the legitimate forces in Almanaqeef and Alsaelih under Alsheik height in the air defense and attempt to infiltrate was repulsed by the legitimate resistance and the Yemeni National Army, indicating that the national forces and army, as well as the popular resistance managed to control the port of Hima, 125 kilometers of Alhadid which is one of the ports used by militias to smuggle weapons. Then, the coalition spokesman answered reporters' questions. He said that "the coalition is working in full coordination with the legitimate Yemeni government, and contacts with all the political and social components inside Yemen, noting that the Houthis in the province of Saada have become inside pliers and the coalition forces are approaching the liberation of the province. On the reason for the delay in controlling the port of Hodeidah, Col. Al-Maliki said that the decision in the hands of the legitimate Yemeni government and the Yemeni National Army in the liberation of Yemeni territory.